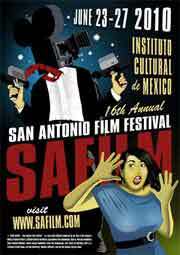 The 16th annual San Antonio Film Festival, which runs June 23-27, is truly a great combination of celebrating local talent and international cinema, screening films produced in Texas to ones produced in Europe, South America and the Middle East. There’s also a distinct flavor of socially aware fictional narratives and documentaries, including films about Tibetan refugees, migrant workers, the 2008 Presidential election, alcoholism and genocide. But, that’s not to say the fest is a totally serious affair as there’s also several genre films about the World Cup, sheep rustlers, dancers, crooks and other ne’er-do-wells. It looks like a fun mix. The full lineup of films is below. The way the festival runs is that films screen in blocks in three different theaters. A “block” of films will generally contain a feature or two (feature = film that is 50 mins. or more), plus several shorts. In the lineup I have up, feature films have descriptions next to the titles and shorts do not. Tierra Madre, dir. Dylan Verrechia. Feature. A Mexican woman fights to raise her children with her female lover. Outrage, dir. Ace Cruz. Feature. After inheriting a fortune, a woman must protect her riches from an ex-military sniper. Charlie Valentine, dir. Jesse V. Johnson. Feature. When a criminal’s big heist goes awry, the crook hides out with his estranged son in L.A.
Florida Road, dir. Brad Glass. Feature. A young Indian man tries to fulfill his dream of becoming a Hollywood screenwriter. Aggies: The True Story of Texas A&M, dir. Josh Smith. Feature. A documentary on the university. Being the Diablo, dir. Rod Murphy. Feature. A Baptist preacher seeks help for his bipolar disorder. Heaven in Exile, dir. Omar Rosales. Feature. A documentary on Tibetan refugees. S.O.S. Antarctica, dir. William Doerr. Feature. Six men sail from Argentina to explore Antarctica. Spiral, dir. Jorge Pérez Solano. Feature. A look at how worker migration destroys families. Leftovers, dir. Robin Nations. Feature. A therapist tries to help a troubled single mom. Roll Out, Cowboy, dir. Elizabeth Lawrence. Feature. A rappin’ country singer tours the country during he 2008 Presidential election. The Last Musketeer, dir. Art Zapata. Feature. A Latino family is destroyed through alcoholism. Cost of a Soul, dir. Sean Kirkpatrick. Feature. Two veterans return home to their crime-ridden neighborhoods. Urban Nutcracker: Anatomy of a Ballet, dir. Gonca Sonmez-Poole. Profiling a multicultural production of The Nutcracker. Fanny, Annie & Danny, dir. Chris Brown. Feature. A family cracks under the strain of raising a developmentally disabled child. Man on a Mission, dir. Mike Woolf. Feature. A documentary on video game designer Richard Garriott. Go for It!, dir. Carmen Marron. Feature. A coming of age inspirational urban dance film. Disney Shot Kennedy, dir. David Lawrence. Feature. Four conspiracy-minded friends face the disappointing closing of their alternative newspaper, The Oswald. Milking the Rhino, dir. David E. Simpson. Feature. A documentary on African tribes starting wildlife tourism businesses. Splatter: Love, Honor and Paintball, dir Lonnie Schuyler. Feature. A man tries to win his wife’s love back in a paintball tournament. Speakers Corner: You Have the Right to Remain Vocal, dir. Gavin White. A documentary on free speech in London. El Dia (The Day), dir. Tao. Feature. A day in the of a suicidal woman. Oveja Negra (Black Sheep), dir. Humberto Hinojosa. Feature. Two farmhands plan to steal and sell their boss’ sheep. Alemania, dir. Luis Blanco Nazoa. Feature. A Miami TV crew tries to film the 2006 World Cup in Germany. Dream Healing, dir. Dora Pena. Feature. A young girl who has the power to heal insomniacs is exploited by her aunt. Flamenco School, dir. Brent Morris & Reinhard Lorenz. Feature. Exploring the rich tradition of flamenco dancing. The Last Survivor, dir. Michael Pertnoy. Feature. A documentary on four real-life survivors of genocide. DANZÓN, dir. María Novaro. Feature. A single mom raises her daughter, works a job and dances the danzon. Six Man, Texas, dir. Alan Barber. Feature. A profile of the struggles of small Texas towns. Broken Dreams, dir. David Crabtree. Feature. A filmmaker turns to drugs to complete his documentary and fall in love.